Skara, Leh - Ladakh - 194101 Jammu & Kashmir, India, Leh - Ladakh. 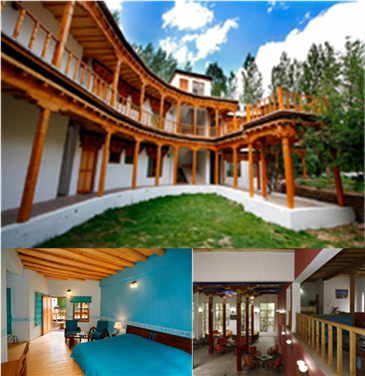 It is a deluxe boutique hotel located at the harmony of the natural surroundings and rich cultural traditions of Ladakh. It is a great place to feel the nature as it surrounded by the picturesque landscapes. All the rooms are accommodated with the traditionally Ladakhi style environment as they are designed with traditional materials, colors, fabrics and painted motifs. One of the primary attaction is the uniquely designed Traditional Buddhist - Style Prayer Room. Tourists from world over flock to see this lovely architecture. Private terraces and garden attached to all rooms.